Explosive hard rockers KOBRA AND THE LOTUS have been tapped as support for legendary bands KISS and def leppard this summer on KISS' massive 40 Anniversary North American summer tour. The band takes to the road in support of their new album, High Priestess, due out in North America on June 24th via Titan Music. 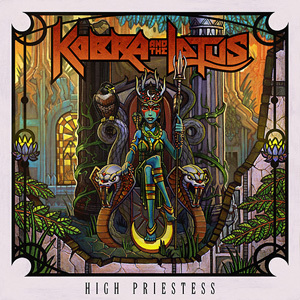 Produced by the Grammy-nominated Johnny K (MEGADETH, DISTURBED, THREE DOORS DOWN), High Priestess delivers a blend of fiery vocals (courtesy of lead singer Kobra Paige), heavy riff-laden melodies and ferocious musicianship. Led by frontwoman, the classically-trained vocal powerhouse, Kobra Paige, KOBRA AND THE LOTUS have been making a name for themselves worldwide with extensive touring and a well-received debut album (KOBRA AND THE LOTUS) in Europe. KOBRA AND THE LOTUS have already played the main stage at such massive European festivals as the UK's Download, Sonisphere (Spain), Hellfest (France), Gods Of Metal (Italy), Bloodstock (UK) and more. The band has also supported the likes of JUDAS PRIEST on tour.